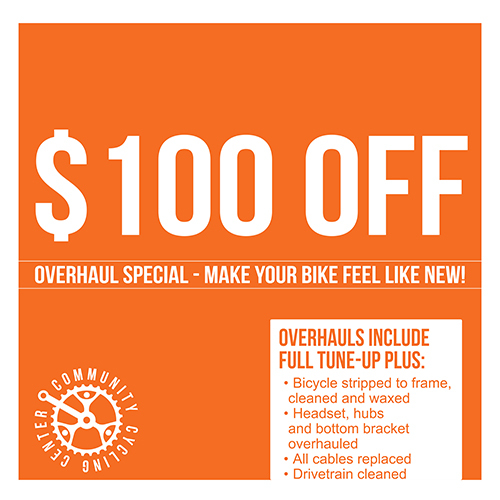 This January and February, we’ll take $100 off the cost of a standard bike overhaul. It’s a great deal at a good time. Why? You may have noticed that it’s pretty chilly out there this week. I don’t know about you, but my garage has been downright cold. When my front tire got a flat the other day, I wasn’t exactly thrilled at the prospect about changing a flat in the garage while feeling my fingers go numb. I suddenly noticed how grungy my frame had gotten over the past month from the winter riding, and then how thin my brake pads were. Despondence started to set in. Why now? Why me? And then I remembered our friendly team at the Bike Shop, and hope returned! A bike overhaul is like a spa treatment for your trusty steed. By the time you pick your sparkly bicycle back from the shop, it will have a special zip in its roll. I couldn’t stop smiling on my ride back to the office from the shop. It was like riding a beam of sunshine on a winter day. Our standard overhaul price is $275 for most road, commuter, and mountain bikes (prices vary based on type of bike). During this special promotion, we’ll take $100 off. Not sure if your bike needs to be overhauled? Stop by our shop and chat with our friendly mechanics.